Sergei Ivanov: Who is the official Putin has just fired? 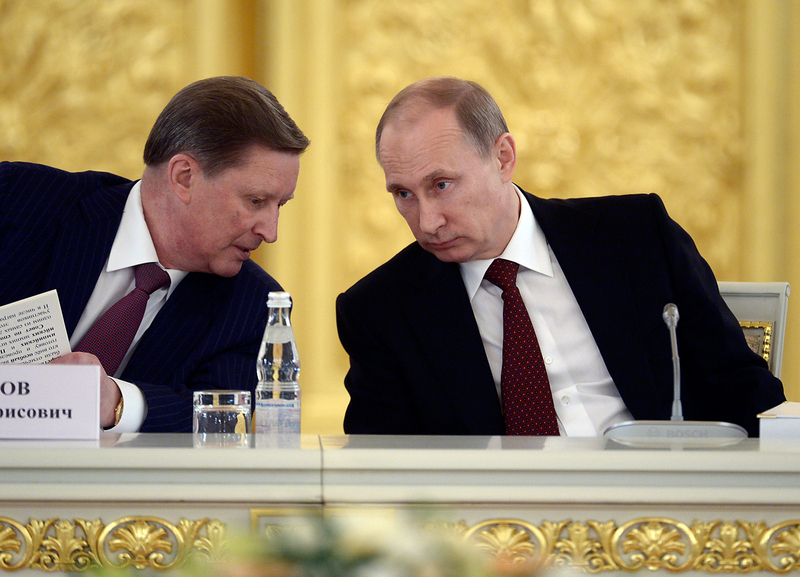 Russian President Vladimir Putin speaks with Sergei Ivanov, head of the presidential administration, during a government meeting in Moscow's Kremlin on March 24, 2014. One of the president’s closest and most loyal associates has lost his job. Sergei Ivanov has been relieved of the post of the chief of Russian President Vladimir Putin’s administration. All throughout Putin’s rule, he has remained at the top of the political tree. On Aug. 12, Russian President Vladimir Putin unexpectedly fired the head of his administration Sergei Ivanov, appointing him (at the latter’s own request, Putin stressed) to the post of special presidential representative for environmental protection, ecology and transport. In the hierarchy of the Kremlin elite, Ivanov was de facto the third most senior official in the country: a member of Putin’s inner circle, “a refined intellectual with impeccable English,” whose career had seen him rise from a role as a spy to the chief of the country’s most important administration. His colleagues in the Kremlin and people who know him say (in Russian) that Ivanov’s main quality, not so much personal as professional, is caution. He has always managed to steer clear of hypersensitive issues while at the same time not ceding his position. Ivanov largely owes his meteoric career rise to his long-standing friendship with Putin. They first met in the late 1970s as fellow KGB officers. Both served at Soviet spy stations: Putin in East Germany and Ivanov in Finland and Kenya. At the SVR, Ivanov was made first deputy director of the European department and in his early 40s became one of the youngest generals. Yet victory in the courtship for the agent went to the FSB when Putin became its head. In 1998, he appointed Ivanov as his deputy, thus strengthening the service’s analytical function (Ivanov led the department of analysis, forecasts and strategic planning). When Putin became prime minister, he appointed Ivanov as head of the Russian Security Council. Having made a good name for himself, in 2001, Ivanov was put in charge of Russia’s Defense Ministry, which at the time was one of the country’s poorest performing departments. The army and the navy were in a sorry state and the country as a whole had not yet recovered from the Kursk nuclear submarine disaster in 2000. Ivanov faced the task of raising the prestige of the Russian military (primarily, in the eyes of the country’s population). He refrained from any drastic actions involving military personnel and started the country’s switch to contract-based military service. Under him, service personnel saw a 50-100 percent pay rise and stable funding was allocated for research and re-armament. From 2005 onward, Ivanov began to combine the post of defense minister with that of deputy prime minister and in 2007, he swapped these two posts for the position of first deputy prime minister. During his first term as first deputy prime minister, Ivanov supervised the military-industrial complex that he was well familiar with. He began to develop the defense sector through state holding companies, with the United Aircraft Corporation becoming his main brainchild (he served as the company’s chairman of the board from late 2006). Among the high-profile projects that he oversaw were the Sukhoi Superjet 100 and the global satellite navigation system Glonass. Another important function that Ivanov performed in the hierarchy of power was maintaining contacts with Washington. In effect, Ivanov was Putin’s envoy for liaising with the George Bush Jr. administration. He issued harsh foreign policy statements and became Russia’s No. 2 figure in the international arena after Putin. It was at that time that the Kremlin corridors of power tipped Ivanov as Putin’s successor: The president’s second term in office was coming to an end. The other likely successor was Dmitry Medvedev, who was in charge of the national projects but had less clout abroad. When Putin returned to the Kremlin in 2011, Ivanov became head of his administration. However, according to media reports (in Russian), since then he has gradually become sidelined, with other officials inside the administration acting as domestic policy architects. Russian analysts are so far in disagreement about the reasons for Ivanov’s unexpected dismissal.